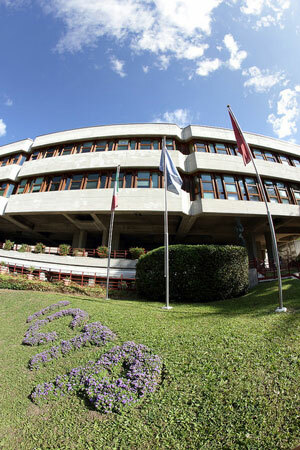 Welcome to the ICTP Multiverse! This blog is a home for all sorts of stories from the global community of physicists and mathematicians connected to the Abdus Salam International Centre for Theoretical Physics. ICTP has a dual mission: to promote research excellence, and to support the development of sustainable science in developing countries around the world, spreading opportunity and resources where they are needed. Multiverse is a new home for those stories, to make sure they get told. Research doesn’t happen in a vacuum: scientists are human too, and humans are a storytelling species. This blog will provide a backstage look, a glimpse into the process and lives of scientists and the science they publish. Most of the posts will be written by scientists or students from the ICTP community, so the stories will be in their own words. We hope these words will inspire you to learn more about physics and mathematics, to share your enthusiasm about science, to study physics and math, or to support physicists and mathematicians in your community. If a post sparks a thought, please leave a comment below the blog posts. We’d like to hear from you. “Science is the common heritage of mankind,” said Abdus Salam, ICTP’s founder. We hope you enjoy the stories of this heritage, from a community using a global approach to tackle pressing problems of our time. Kelsey Calhoun is a science writer in the Public Information Office at ICTP. Looking forward to reading more articles here. It would be easier if a subscription link is added somewhere so that we get notified when a new post is published. Done! Thanks for the suggestion, glad you want to subscribe.